Note: Updated review: originally posted on old blog. 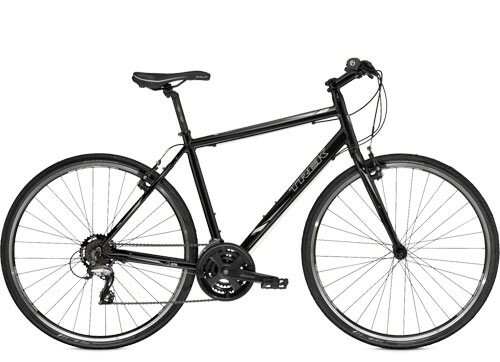 Trek 7.1 FX is one of Trek’s best selling models. For £350- £375, you get a lot of features for your money which will appeal to a broad spectrum of commuting cyclists. It’s not surprising why it is so popular. For most commuters and newbie cyclists sticking to roads, this bike does pretty much everything you need. It is reliable, solid and gives a good riding experience without any expensive extravagances. It comes with 21 gears, and a very low ratio for getting up steep hills. Some may find the top gear of 48*14 a little on the slow side. You have to maintain a pretty high cadence to get over 25mph. But, I doubt most people buying this will be worried at a lack of high end speed. If you are, you’re probably buying the wrong bike, and should look at a cheap road bike. On the downside, the bike is a little heavy and rigid. If you’re riding over rough terrain like a canal path, your hands will certainly start to feel the vibrations on these minimal handlebar grips Despite the 35″ tyres, even riding around Leeds city centre I thought it a little tough. If you can upgrade to the next FX model like the Trek 7.2 Fx – you get a lighter weight frame and more cushioning in the handlebars. As I am used to riding stiff road bikes, this rigidity isn’t a big disadvantage to me, but, if real comfort is important, you may want to look at other hybrid bikes with suspension and a more forgiving set up. On the plus side of comfort, I thought the Bontrager SSR saddle was excellent. Lovely shape and padding make it really quite comfortable. The gears are easy to use. Not instantaneous, but good enough given it is based on the lower end of the Shimano scale. You need to think ahead to get a burst of speed from lights, but, I was quite happy with the Shimano gears clicking away. The brakes are Tektro lever pull – quite a common option for this type of hybrid bike. They offer reasonable, if unspectacular performance. Again an upgrade to disc brakes offers a significant improvement. Pretty good. The set up is closer to road bike than mountain bike. Though the position can be adjusted with the riser bar. It felt nimble enough riding around town. Again solid and reliable rather than cutting edge. Comes with mudguard and pannier holes, that you can add onto if you want. For overall commuting, the Trek 7.1 FX is a good all rounder. Fast enough to outperform thicker mountain bike style bikes, but with a greater stability to more aggressive road bikes. Bontrager tyres. Uncertain of how these compare over time. There are better puncture resistance tyres on the market, which can always be added to. This best-selling hybrid bike is popular with good reason. Trek know what a typical hybrid bike buyer is looking for. It gives very solid performance, though as someone who has ridden many different bikes, it does leave you dreaming of upgrading to get better features. Trek bikes come in a variety of sizing so will fit most riders. There is also a womens version with step through frame. Who Would This Bike suit? It would suit someone on a very strict budget of keeping the price down to below £350. If you’re the kind of bike rider looking for something special and a bit of zip, you will have to save more money. But, if you want a solid hybrid bike with minimum of fuss, then you can’t go too wrong with the Trek 7.1 FX. Note: it wouldn’t be a great buy for any substantial off-road riding because the rigidity make for an unforgiving ride. I really like its silver color by the way, the whole desing it’s inspiring elegance I guess.